In Mahabharata when five Pandavas & their wife went into forest for 12 years they lost the game of Chopat with Duryodhana, that time Draupadi used to cook food in a patra ( dish/bowl ) named Akshaya Patra ( Akshaya meaning never finishing ). She can get as much food as she want for their daily need. Once after Draupadi eats her meal, the Akshaya patra stops producing food for same day. So When Pandavas returned to their home back, what happened to that Akshaya Patra ? Here are the references of the verses of Mahabharat of this scenario. Here, "Surya-Dev" says that he will provide them food for 12 years. So, according to this statement, the Akshay-patr, either lost it power after 12 years, or it went back to Surya-Dev after 12 years. 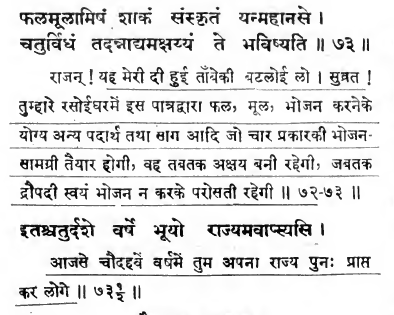 Please note that: Dharm-raj is a reference to yudhistr in this verse. And the Akshay-patr was given only for the "van-was" of 12 years, not the agyat-was of 1 year. Not the answer you're looking for? Browse other questions tagged mahabharata pandavas draupadi .